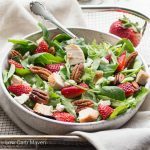 Enjoy this spinach strawberry pecan salad with homemade balsamic dressing and a salty or tangy cheese brings salad to the next level. Each bite delivers earthy, sweet, tangy, salty and crunchy flavors. The arrival of warmer weather brings with it the promise of strawberry season. 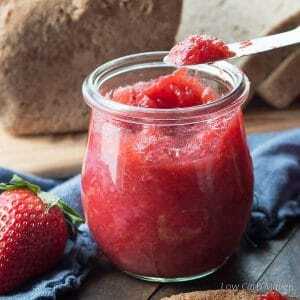 Who can resist the sweet-floral-almost spicy-tang of deep red strawberries fresh from the field? I know I can’t! California is a big strawberry growing state, producing a whopping 83% of strawberries grown in the U.S. Our local roadside produce stands keep me in low carb red berry heaven from March to July. 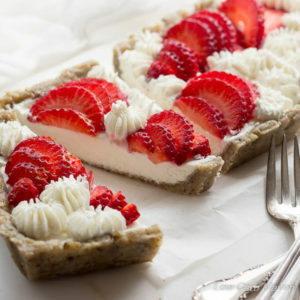 I have used strawberries in several desserts on the site like strawberry shortcake, muffins, tarts, strawberry cream pie and crumble bars. But one of my favorite ways to enjoy them is in salads like this spinach strawberry pecan salad. Strawberries, as well as blueberries, raspberries, and blackberries, are the best low-sugar fruit options for low carb keto diets. Pairing a few sweet berries with crunchy nuts, and then adding a great salty cheese takes a regular salad to the next level. On Sundays, I start our weekly meal prep by washing lettuce and preparing our salad protein for the week. I often cook and slice a few pounds of herbed grilled chicken and make a delicious low carb salad dressing. Our favorite flavor profile this month is spinach strawberry pecan salad with homemade balsamic dressing. Strawberries and balsamic vinegar is classic pairing and the sweet crunch of pecans and earthy flavor of spinach all combine to create something wonderful. Some recipes for this salad combination call for candied pecans. I love ‘em, but I think toasted pecans or even raw pecans are just as good. I toast them in the oven on a sheet pan at 350 degrees F until lightly browned and fragrant (or toaster oven) and use them throughout the week. As far as cheese options for this delicious spinach strawberry pecan salad, salty and/or tangy varieties do well. We like feta cheese, goat cheese, or an aged cheese like Parmesan or Asiago. If you like steak salad recipes, try this steak and plum salad with balsamic reduction. It’s another great flavor combination of beefy, peppery, sweet-tart and salty! 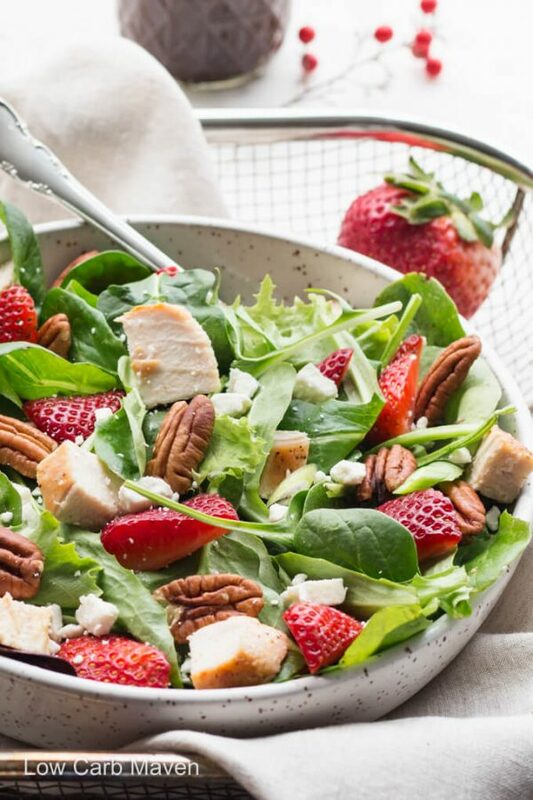 This Spinach Strawberry Pecan Salad is 7.5 net carbs per serving. Slice the chicken, strawberries and onions. Layer the ingredients in two bowls and pour the dressing over. 7.5 net carbs per salad. Nutrition facts assuming all of the dressing is used. 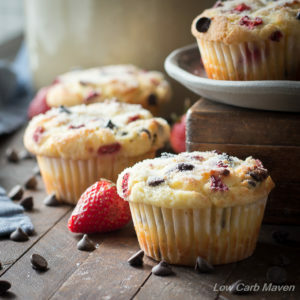 Unlike the rest of the fruits, berries have a pretty low glycemic index and a low glycemic load, which differs from the glycemic index in that the former turns nutrients into sugar fast while the latter is how much carohydrates a food contains. For example, carrots have a high glycemic index but they have a low glycemic load because of all the fiber. Therefore, carrots don’t affect your blood sugars too much. I made this for dinner tonight and absolutely love it! Thanks for a great recipe! Looks super healthy and super tasty! Easy to make as well. 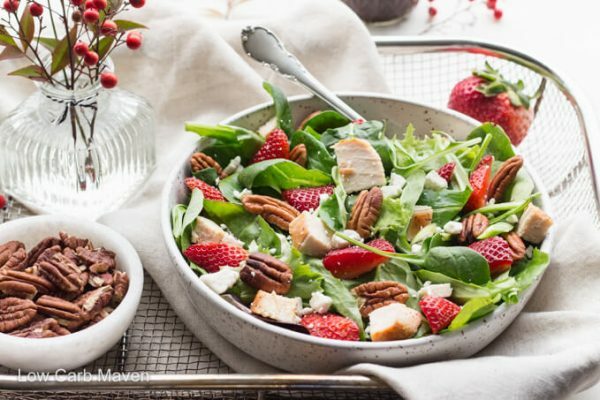 I adore this kind of salad, I have a chicken strawberry salad with greens I have been making for years, it is a must during every strawberry season. Your version is wonderful and you are right about the candied pecans, they taste just as good without the sugar and in this case, if the strawberries are good, they add enough sweetness anyway. Salad looks delicious but I don’t see how many pecans to add. did I miss it? Agree about not using candied ones.